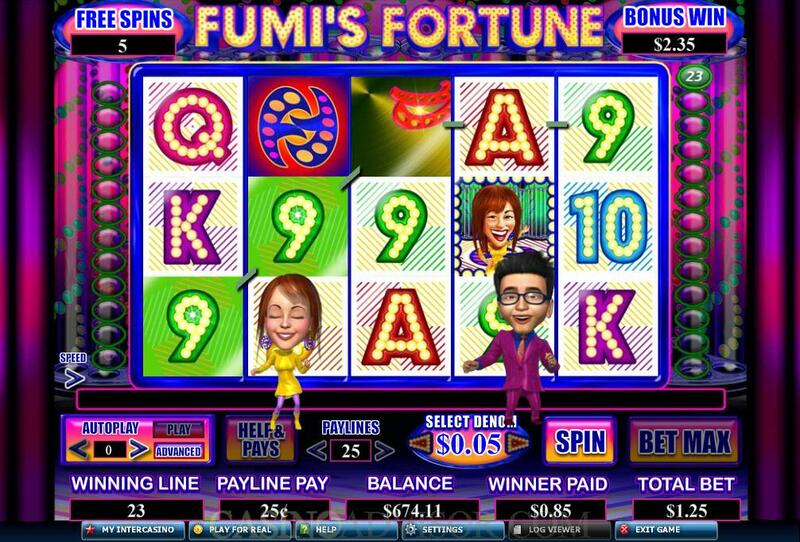 Fumi’s Fortune has the popular Japanese game show as the theme. The unbridled energy of the game show is brought to this slot game with loud music, bright colors and out of the world animations. The Wild logo is the wild symbol and the Fumi’s Fortune Logo is the scatter symbol. The hosts Fumi and Aki are also represented on the reels. Psychedelically stylized high value card symbols from A to 9 are also there. The background music during the normal spins is loud and cheerful. All symbols exhibit animations. Fumi takes center stage in the game show and acknowledges the cheers. The Fumi and Aki bubbles start rotating round and round. Surprisingly the high value card symbols have the best animations. The lights become brighter, the background changes color and starts rotating. 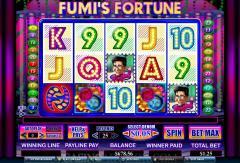 Fumi’s Fortune is a 5 reel video slot game from Cryptologic. Players can activate from 1 to 25 paylines. Players can bet only one coin per payline but the coin denomination varies from 0.01 to 20.00. Therefore the maximum line bet is 20.00 and the maximum total bet per spin is 500.00. Clicking on the Bet Max Button activates all 25 paylines at the chosen coin size. The Wild Logo is the wild symbol. It substitutes for all symbols except for the scatter symbol. It offers the highest line payout of 1000 coins for getting five Wild Logo symbols in an enabled payline. It does not multiply payouts. Fumi’s Fortune Logo is the scatter symbol. Two or more scatter symbols anywhere on the reels offer scatter payouts. 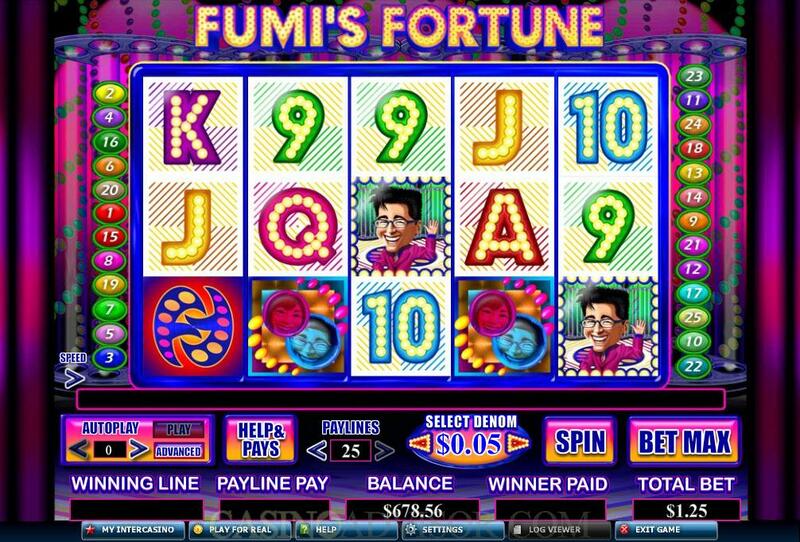 Fumi’s Fortune slot game has a unique free spins game. It is triggered randomly after a spin in which the Fumi. Aki or Bubbles symbols appear. One or more of these symbols will become a wild symbol during the free spins and remain as a wild symbol throughout the free spins. They will substitute all symbols except the scatter symbol. During the free spins the wild symbol can re-trigger 8 more free spins. 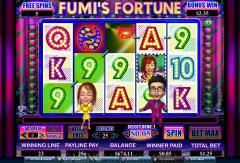 Fumi’s Fortune has a comprehensive Auto Play feature. Players can set the number of spins required, the number of paylines and the coin size from the set up menu in the Advanced Auto Play. Players can enter certain conditions which will automatically stop the auto play. These conditions are a cumulative win of a specified amount, a cumulative loss of a specified amount and a single win of a specified amount. The player can choose from three game speeds. The slowest speed has complete animation of the reels spinning. In the fastest speed there is no animation at all. Interested in reading more detailed information about Fumi's Fortune? If so Click Here for more details.